I wasn’t completely sure what to expect going into this book. I didn’t read the blurb but the cover was so alluring to me I just had to have it. I needed it. Plus, I have enjoyed many of Allen’s other books, so I knew I would at least like this one. But when I finished the book I was completely satisfied, way more satisfied than I even thought I would be. And by saying that I have to add this: Not knowing what this book was about- intensified my experience in the greatest way. This is not just a romance. And for that- I was very thankful. Not that it wouldn’t have been a bad thing, as a reader I have just been wanting more than that here lately. I was so surprised to know that there was so much suspense and even a well thought out twist within this book. I was happy to know that K.K. Allen branched out into something and wrapped it up so neatly. No plot holes to be found. I was a happy reader. K.K. Allen’s writing in Waterfall Effect is electrifying and piercing. That is the only way I can put it. When she writes, whether from Jax’s POV or Aurora’s- you feel. You feel so much. Not only was the writing completely engrossing, I loved the metaphors within this story and the way they all related. When you read this book, you will see what I’m talking about. It’s hard to miss. 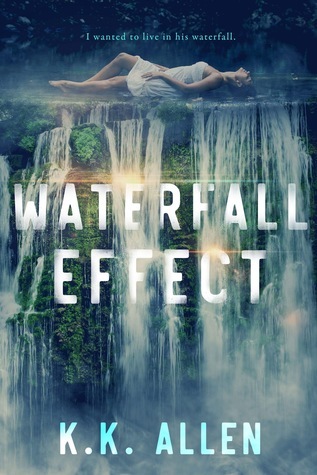 Waterfall Effect was a meaningful read on so many more levels than just romance. I was hooked from the beginning and all of that alone sets this book apart from most of the others that are currently out there. I can’t wait to read this!! That cover though….